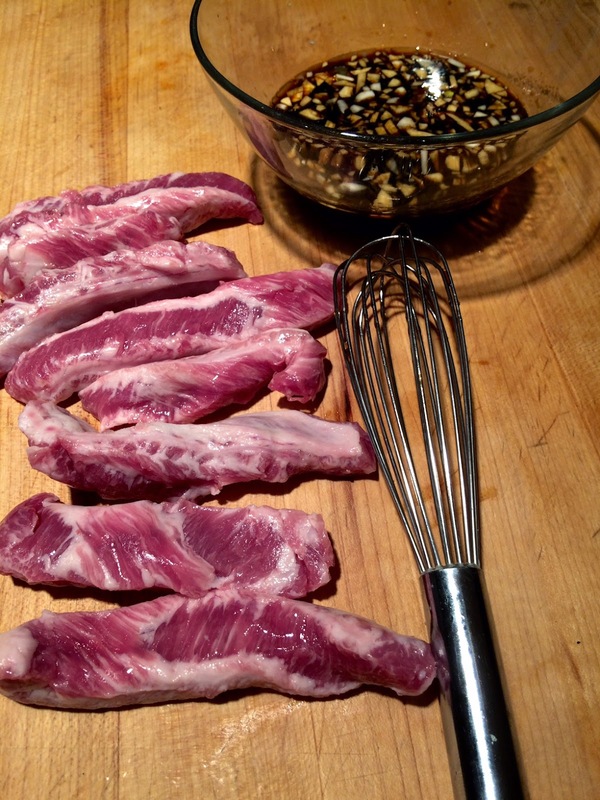 To Market, To Market with San Diego Foodstuff: Name that Pig Part! I've been spending some time with the butchers at Cook Family Butcher Shop in Kearny Mesa for a story I'll be posting in early January on my Close to the Source blog on Edible San Diego. It's a very cool place, owned by Cook Pigs Ranch in Julian that I hope you'll visit and buy from. But, there's one cut that I recommend that as of now still has no name. While I was watching owner and plant manager Nick Bartsch, head butcher Travis Stockstill, and their crew transform halves of pigs into more familiar roasts, hams, loins, and chops, there grew a pile of longish strips of meat and fat--perhaps one to two inches wide and four or more inches long--that grew increasingly appealing to me. This was the strip that sits between the long bones of tomahawk chops. To get that handle just right, they have to cut out the connecting meat between the bones and, well, I couldn't see that going to waste. As it happens, Nick couldn't either. He had taken a pile of them home and was marinating them in a blend of Worcestershire sauce and soy sauce. I think he was in day four when we were chatting about it. I was ridiculously enthusiastic about this and he sent me home with about half a dozen to try. I figured it would be simple enough to enjoy them cut up into bite-sized pieces and stir fried with vegetables. But what I really wanted to do was marinate them for a few days and then run them under the broiler to see if they'd crispen up. So, I piggybacked on Nick's idea and created a marinade of soy sauce, Worcestershire sauce, sesame oil, minced garlic, and red pepper flakes. I marinated the strips of meat for three days. Then under the heat they went for about five minutes total. They had a lovely gloss to them and curled up, almost like grilled octopus. Next time I'll try weaving them on skewers. Regardless, they were delicious. It turns out they didn't get especially crispy. The texture was on the chewier side--not tough, but a mouth satisfying resistance with every bite. And, they had the most incredible sweet salty garlicky flavor, warmed by the sesame oil. So, I'd like to suggest you ask for them, but they have no name. We joked around at the time with some ideas, like boneless ribs (not exactly accurate). Do you have a good idea for a name for this obscure pig part? Give me your suggestions and I'll pass them on to Nick and Travis. Wishing all of you a very Merry Christmas! 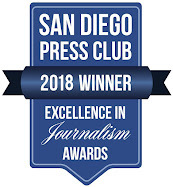 Multiple winner of Excellence in Journalism Awards from the San Diego Press Club. 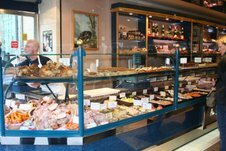 Subscribe to San Diego Foodstuff and Get New Posts by Email! 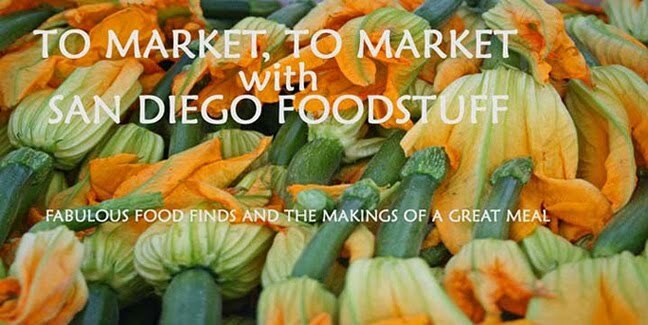 To Market, To Market... With San Diego Foodstuff is your guide to the culinary treats found beyond our region's homogeneous supermarkets--in ethnic markets, artisan bakeries, specialty gourmet shops, produce markets and more. San Diego County has a host of farmers markets and farm stands. Check the San Diego County Farm Bureau site for information.